10 1/2 by 15 in. 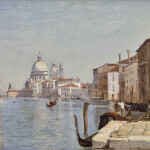 “Venice had delighted him [Corot] above all. He was particularly struck by the transparency of the salt air, by the brilliance of the light, by the joyful coloration of the buildings that the waters of the Grand Canal reflect with still more delectable intonations.” - Émile Michael, early Corot biographer. Corot has been hailed the most poetic landscape painter of nineteenth-century France, and the plein air studies executed on his two Italian campaigns were certainly formative in the development of the artist’s technique and aesthetic. Indeed, Corot considered his first trip to Italy, between 1825 and 1828, the culmination of his artistic training, and he returned to the country in 1834. In the early landscapes executed there, he focused on the effects of light on water and the panoramic view, studies that he would continue to practice after returning to France. At the time of Corot’s death in 1875, the critic Philippe Burty emphasized the significance of the Italian landscapes: “Some of these studies, very personal works and marked by the delicacy of drawing and the keenness of the overall structure, are famous in the studios. Corot lent them willingly, and they have had a happy influence on the contemporary school” (as quoted in Peter Galassi, Corot in Italy: open-air painting and the classical landscape tradition, New Haven, Conn., 1991, p. 3). Corot had only a brief interlude in Venice at the end of his first Italian tour in the summer of 1828. A plein air study inscribed ‘Venise, 12 Juillet,’ which illustrates Santa Maria della Salute from the Campo della Carita, is one of five known subjects from this visit. When he returned to Venice in August 1834, he reprised his view of the site depicted in the earlier oil sketch, making it the subject of the present work. The simple composition, spontaneous paint handling, and intimate scale suggest that this image was painted from nature. “Venice had delighted him above all,” wrote an early Corot biographer, Émile Michael, “he was particularly struck by the transparency of the salt air, by the brilliance of the light, by the joyful coloration of the buildings that the waters of the Grand Canal reflect with still more delectable intonations” (as quoted in Gary Tinterow, Michael Pantazzi, and Vincent Pomarède, Corot, exh. cat., New York, 1996, p. 130). 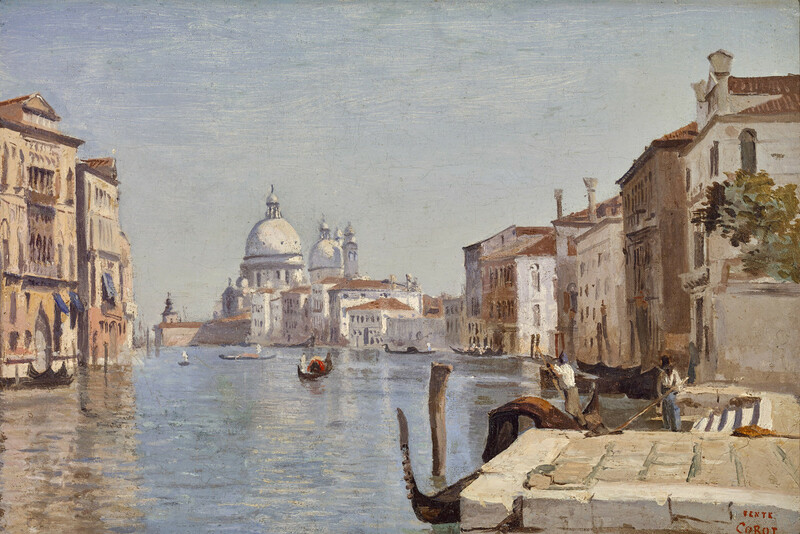 Corot’s fascination with Venice and adeptness at treating the impressions of light and distance upon space are evident in this view of the Grand Canal with Santa Maria della Salute in the background. It is, moreover, a fine example of the open-air painting tradition and of Corot’s great sensitivity to nature. The present work once belonged to the French financier, Ernest May, whose collection included old master and eighteenth-century pictures as well as significant works by Édouard Manet and Edgar Degas. May appears as a central figure in Degas’ Portraits at the Stock Exchange (Musée d'Orsay, Paris).